The San Luis Police Department has experienced a rise of illegal dumping of trash occurring in the surrounding areas of our city and is asking the community to report any occurrences in order to avoid any potential hazards or accumulating trash that could affect the city’s image. We would like to remind the community that dumping trash on public and private property is a violation of Arizona State law, which may potentially lead to an arrest. 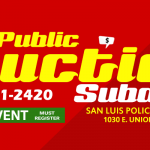 The San Luis Police Department is committed to the health and safety of our community and is our mission to work in partnership with our community to enhance the quality of life and provide a safe environment. For any information of any illegal dumping please call at the San Luis Police Department at 928-341-2420.